The laboratories of GWIN faculty provide opportunities for a broad range of research training in Neuroscience. Students in the GW Institute for Biomedical Studies (IBS), an interdisciplinary program dedicated to providing state-of the art Ph.D. training for biomedical scientists, or GW graduate programs in Psychology, Biology, Speech and Hearing Sciences, Education or Public Health are encouraged to pursue opportunities for Ph.D. research in any of the GWIN laboratories. For more information on graduate training opportunities available through the IBS programs please contact Dr. Linda Werling. For information on other GWIN opportunities for graduate training, please contact Dr. Anthony LaMantia, Director, GWIN. GWIN also facilitates graduate training in the neurosciences via a graduate course in Neural Development and Developmental Disorders offered through the Institute for Biomedical Studies (IBS), an interdisciplinary program dedicated to providing state-of the art Ph.D. training for biomedical scientists. This course, offered as part of the curriculum in Neuroscience Track in the Molecular Medicine Program of IBS, is an elective open to IBS students, as well as graduate students in departments at the Columbian Colleges of Arts and Sciences, as well as other GWU professional schools. The course will be taught as a module in the Molecular Medicine Program curriculum in the spring semester. The tentative 2011 Course Syllabus and Schedule is provided below. This 8-week course will integrate basic biological and behavioral approaches to understanding the cellular and functional development of the brain—especially the human brain—with clinical approaches to understanding and treating developmental disorders including epilepsy, mental retardation and autism. The course will approach a series of integrated questions about how brain and behavioral development occurs, and how it can go wrong. Basic concepts and vocabulary for understanding brain and behavioral development will be presented, as well as fundamental clinical information on relevant developmental disorders. Integration will be reinforced based on reading and discussion of a single research paper each week that brings together multiple approaches to examine specific developmental disorders. Course meeting time will be 8:30-10:30, M-W (unless otherwise noted), in a location to be announced. Week 1: How is the brain built? 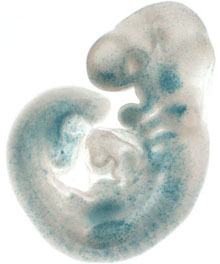 Week 2: How can the earliest steps of neural development go wrong? Week 3: How can cortical neurogenesis and migration go wrong? Week 4: How can neuronal communication go wrong? Week 5: How can movement control and bioenergetics go wrong? Week 6: How can social cognition and interaction go wrong? Week 7: How do language and thought go wrong?